Not too many drought stories have focused on cotton. As one of the thirstiest crops, it was long abandoned by many farmers in the regions hardest hit by unprecedented water scarcity. Except for one part of Arizona, where cotton blooms defiantly, even today. Because here, the more cotton fails, the more the US pays farmers to keep growing it. As part of ProPublica’s new series Killing the Colorado, Abrahm Lustgarten and Naveena Sadasivam travel to Arizona, where cotton—an incredibly water intensive plant which has been historically grown in the moister Southeast—is the second most-planted crop in the state. Why exactly are farmers growing cotton in the desert? Because cotton farmers are financially protected in a way that other farmers aren’t. In fact, they even receive insurance on their fields which guarantees that they’ll still make money—even when their crop fails. The payments, part of the U.S. Farm Bill, are a legacy of Dust Bowl-era programs that live on today at the urging of the national cotton lobby and the insurance industry. Similar subsidies support corn, rice, wheat and, indirectly, alfalfa — all of which also use lots of water. 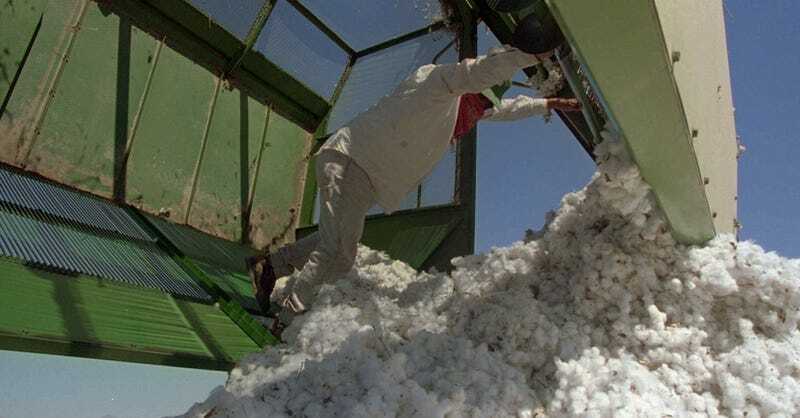 But in Arizona one of the driest states in the nation, it’s cotton that has received the most federal aid, tipping the balance on farmers’ decisions about what to plant. I’ve written a bunch about the outdated laws which are holding back reform in California. But this is perhaps the most backwards of all the drought policies in the US. And the fact that it was explicitly drafted to help farmers after the Dust Bowl—by far the worst climate-related disaster the country has weathered—is even more frustrating. The US government is actually paying farmers to drain the Colorado River. Head over to ProPublica for an enlightening, depressing read. And stay tuned for the rest of the series.